Marketing professionals today are inundated from all sides with hype about the future of big data, AI, and machine learning. Whether the takeaway is better reporting, concern for job security, or mathemagical seeming insights, everything boils down to big data and the mysterious “black box” of AI and machine learning. At conDati, we’ve created conDati Marketing Analytics to allow marketing professionals to capitalize on the real gains machine learning and data science have made in the last 5 years. Combined with cost savings from new cloud computing services, we take advantage of the best open source offerings and combine them with top data science talent. The result goes beyond big data and toward real actionable insight for your marketing campaigns, such as proving ROI on your marketing campaigns which, according to a recent survey by HubSpot, 40% of marketing teams say is their top marketing challenge. When the CMO can present on-demand reports to the executive team that prove the ROI of their campaigns, one result we’ve seen is a more unified approach. Everyone can dive into the reports and insights and clearly see what action needs to be taken. Suddenly, everyone is on the same page and ultimately, the same team. It truly isn’t about the data — it’s about what can be done with that data that counts. As noted by Judea Pearl in his latest book, “The Book of Why,” the gains to be had from AI and Big Data come not from the data as much as from the insights that can be provided through rigorous and skilled use of the best data science. And that is where conDati steps in. We begin by taking diverse marketing data streams, cleaning, blending, and wrangling that data into a unified data set, and then we use our decades of knowledge to provide insights on your marketing campaigns that go to the heart of what matters: real revenue insight that the entire executive board can appreciate. Ready the Data Set, Action! One of our alpha clients, Mauricio Acevedo of Pepperdine University has said, “conDati has put data science at our fingertips.” That realization comes from not just automating and integrating multiple data streams, but from the actionable insight he gets from that unified data set. And this is what we see from our clients: it’s that aha! moment when they peel back the curtain on their data to find insights they didn’t expect. Instead of seeing a mere three to ten percent of their data, conDati’s insights take into account the entirety of the data at hand. The result is increased revenue as teams can act quickly on real-time on-demand reports and pivot or change course when necessary to take advantage of newly uncovered opportunities or react proactively to risks. Though we can’t absolutely guarantee that conDati can save your job, we can save you the average 3.55 hours per week marketing professionals spend on rote, routine marketing analytics tasks. 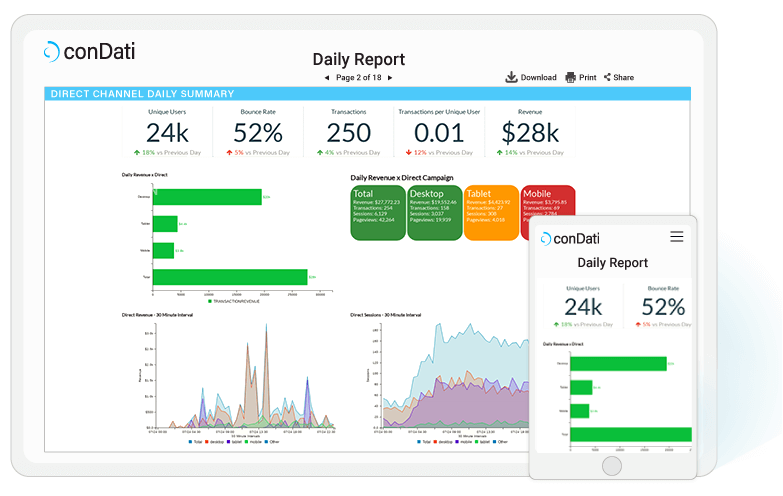 Combined with the new insights gained from using conDati Marketing Analytics, you’ll be able to see real ways to save money on your campaigns while also having the data science at your fingertips that will allow you to take advantage of those new found opportunities and reap the (revenue-based) rewards. conDati’s data science solutions improve Marketing’s business results.